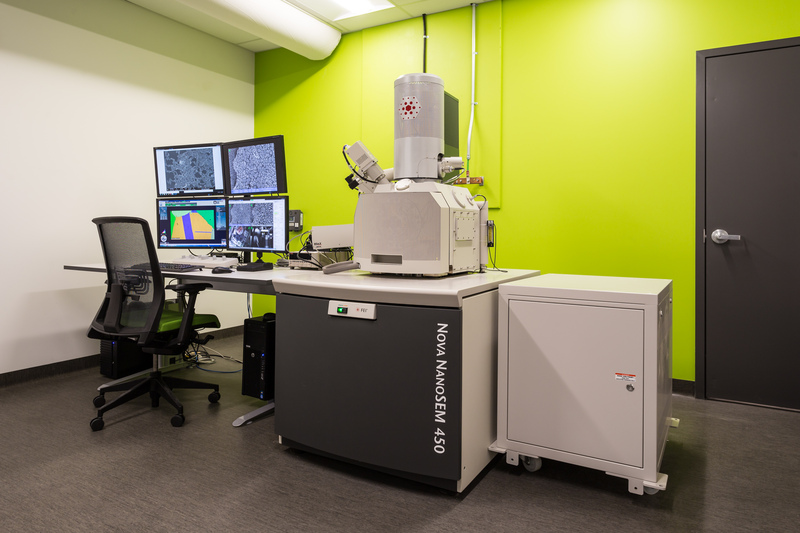 MIM’s FEI Nova NanoSEM is a high-resolution scanning electron microscope (SEM) with advanced optics including a magnetic immersion lens for imaging a high magnification. Equipped with a field emission gun for high beam current and an in lens detector for secondary (SE) and backscattered (BSE) electrons. The Nova also includes a low vacuum mode for non-conductive samples while still allowing excellent resolution. The instrument supports beam deceleration for improved resolution and contrast. Elemental characterization is available through energy dispersive (EDS) and wavelength dispersive (WDS) spectroscopies. The instrument is also equipped with an electron backscatter detector (EBSD) for crystallographic identifications. A large chamber allows a wide range of samples to be analyzed.